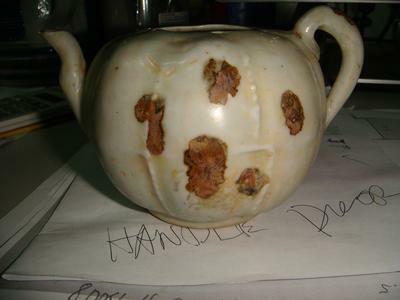 Hi may i ask if you have any idea of this tea pot and is this an authentic song dynasty celadon? the seller say it was came from digging in province. I'm having a problem with the flat bottom. I have never seen one on such a type of teapot. If it had a foot rim I would be less suspicious. And, it does not look like a genuine Yuan bottom either. I stand to be corrected, but I would not touch this. The iron spots aren't usually that ugly and big and they may appear on green wares. Not seen them on white ones. Also some food for thought. I'm not sure if there were ANY teapots of that sort in existence in the Song or Yuan dynasties. 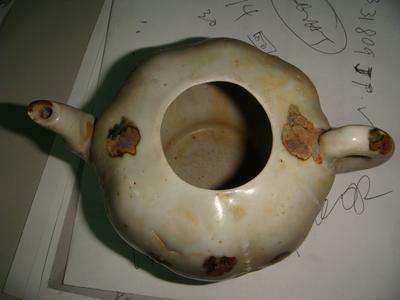 During or before the Song dynasty the majority of teapots were made of pewter, pots made of clay started just appearing then. Would they have had such pots then? I don't know. But then again, the pot looks strange to me. Hope you didn't pay too much for it. Well, I have never seen such a teapot, and I have never seen such a bottom on a teapot. The question is perhaps how long before the digging was it buried there? I assume you understand what I think. That is one of the games they also play in China.